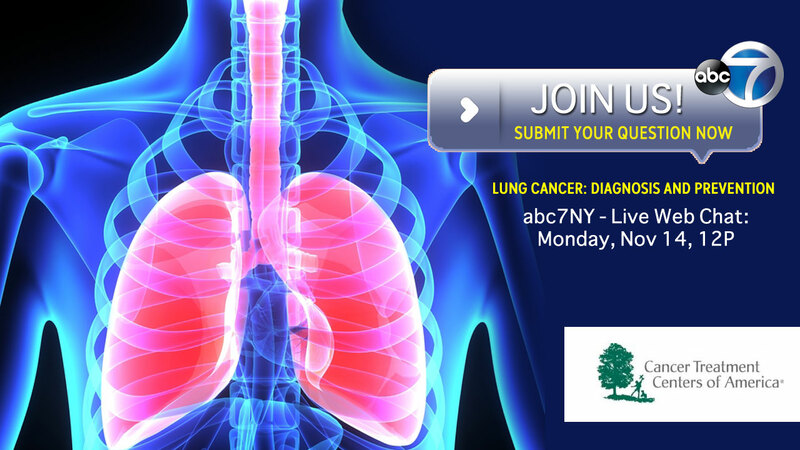 NEW YORK -- Have you or a loved one had a lung cancer diagnosis? Our experts from Cancer Treatment Centers of America are committed to helping you understand the complexities of the disease and the array of treatment options available to you, so you can make informed decisions about your care. They joined us on abc7NY Monday, November 14th to discuss the topic and answer your questions. Watch the video of our chat right here on abc7NY. In this segment: Percentage of lung cancer survivors, and percentage of lung cancer patients who have never smoked. Who should have early screening done? Who is at highest risk? Does quitting smoking cut your risk of lung cancer over time, and how much? Is there a correlation between pulmonary disease and lung cancer? What, aside from smoking, leads to lung cancer? How does immune therapy work? Viewer question about lung needle biopsy. Question about 'small growth' found on lung. Question about diet, supplements and cancer. Discussion of aggressive small cell lung cancer. Discussion of vaping and natural tobacco. Second-hand smoke risks. More discussion of screening, and benefits of quitting smoking. Surgical and non-surgical options. How patients respond to various treatments. Immune therapy and improved quality of life during lung cancer treatment. What is interventional pulmonology? Viewer question about second-hand smoke. False positive rates in lung scans. Activity and how it can decrease various health risks. What role do clinical trials play in treating cancer? Viewer question about smoking during treatment. Viewer question about lung cancer risk after beating breast cancer. Second-hand smoke, asthma, and lung cancer. Viewer question about homeopathic treatment. Best way to stop smoking. Dr. Emil Abramian, Director of Interventional Pulmonology and Critical Care Physician, values the time he has to demonstrate the Mother Standard of care at Cancer Treatment Centers of America (CTCA). "I approach every patient as if they are family," he says. Dr. Abramian earned a Bachelor of Science in Biological Sciences at the University of California, Irvine in 2000. He attended medical school at St. George's University School of Medicine in Grenada, West Indies, earning his degree in 2006. He completed his residency in internal medicine at Allegheny General Hospital in Pittsburgh, Pennsylvania in 2009, followed by two fellowships. At Drexel University College of Medicine/Hahnemann University of Hospital in Philadelphia, Dr. Abramian completed a fellowship in pulmonary and critical care medicine in 2012, serving as Chief Fellow from 2011 to 2012. He completed a second fellowship in interventional pulmonology at CTCA in Philadelphia. During his medical training, Dr. Abramian served as a part-time hospitalist and intensive care physician at CTCA. In 2013, he joined CTCA as a full-time physician. Dr. Abramian has participated in research studies focused on various interventions for pulmonary conditions. He has presented at local and national meetings, and has published research in the medical journal Chest. Dr. Abramian is board certified in Internal Medicine, Critical Care Medicine, and Pulmonary Disease by the American Board of Internal Medicine. He holds a medical license through the State of Pennsylvania. He is a member of the American Association for Bronchology and Interventional Pulmonology, the American College of Chest Physicians, the American Thoracic Society, the Society of Critical Care Medicine, and the American Board of Internal Medicine. At CTCA, Dr. Abramian provides critical care medicine to patients in the intensive care unit. As an interventional pulmonologist, he provides interventions and diagnostic tests using a wide range of tools, from basic to advanced. Dr. Abramian is inspired by his patients on a daily basis. "My patients are what I enjoy most about working at CTCA," he says. "I make sure to provide them with honesty and a detailed review of their medical information because that is what they deserve."